In truth, former heavyweight king Wladimir Klitschko has not said too much about his November loss to Tyson Fury. Apart from stating, early on after the points defeat, that the loss had hurt him deeply and that he was “suffering,” Klitschko has been out of the public eye – so much so that some fans wondered aloud whether the near 40-year-old really wanted the contracted return bout. “Rematch vs. @Tyson_Fury still in the making. I will keep you posted. Meanwhile staying in shape,” Klitschko messaged. What the exact wait for the fight being formally announced is is anyone’s guess, but the venue and the TV coverage are probably the issues still to be worked out. At least we now know Klitschko still has the zest to fight and that he has his mind very much on the return meeting. Klitschko, pictured doing press-ups in the photo, looks to be in fine physical shape, as is to be expected with a true pro such as himself. Never will we see Wladimir balloon up in weight between fights. The big question surrounding the rematch and Klitschko’s chances of gaining revenge is, how will his mental game hold up. 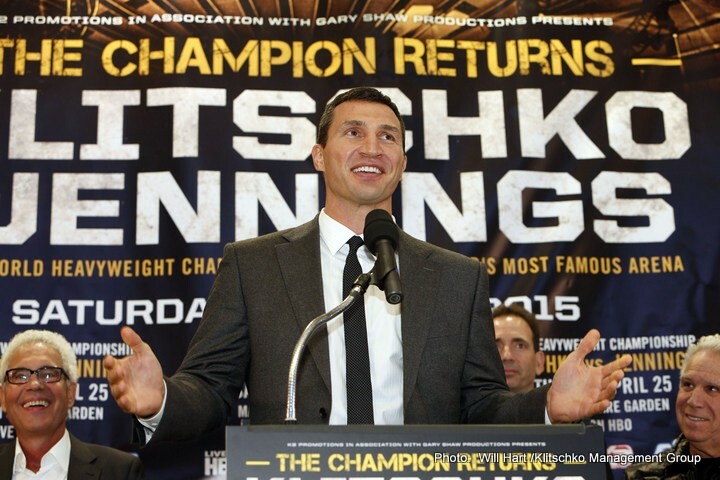 How badly affected was Wladimir’s confidence last November? Can Klitschko beat Fury and his, shall we say, unorthodox approach? Does Klitschko believe deep down that he can beat the man who is so much younger and even taller than he is? Fans who were worried we would never get our answers can at least rest easy. The rematch will happen, it’s just a matter of exactly when. The latest date being floated around is June 4th. Will it be repeat or revenge? Could we even see a third clash between the two giants?